This story begins as an expedition lands on the island of Bengalla, seeking the legendary skulls of Touganda. Believed to harness an energy force of immeasurable power, the skulls could spell disaster for mankind. And that's exactly what ruthless Xander Drax (TREAT WILLIAMS) has in mind...unless one man can stop him. 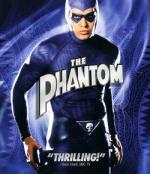 Now evil has met its match and great movie adventure has a new name – THE PHANTOM! I first saw this one several years ago. I think I rented it on VHS. I've seen parts of it on tv every so often as well. I remembered liking the movie overall even though I couldn't remember much so I decided to go ahead and pick up the Blu-ray when I found it for $8. This works very well as a fun, adventure type of movie. Some of what happens is a bit silly or far fetched, but it still works overall. The movie is very entertaining. In some ways, it reminds me a bit of the Indiana Jones movies. There is a lot of action throughout the movie, which keeps things moving at a fairly fast pace. The action scenes are done well. There is a bit of violence, though it isn't that graphic. There is a bit of humor every so often as well too. The story is interesting even though it is a bit silly and could have been stronger. The characters really weren't that developed, but the cast does fine with the parts. There aren't any extras on the Blu-ray. When I doubled checked some information about the movie, it said there were some scenes deleted from the movie, but they aren't on the Blu-ray. I would have liked to have seen them. The movie is only available on Blu-ray now, though I think it was released on DVD previously. Overall, I really enjoyed this movie and am glad I decided to get the Blu-ray.